Members of civil society gathered in Colombo recently under the guidance of Center for Policy Alternatives and formed a movement named Citizens Initiative for Constitutional Reform in order to spearhead the process of gathering suggestions from the General Public for constitutional reforms. There would not be a Constituent Assembly as in 1972 and instead there would be a whole-house Parliamentary method where the entire Parliament sits as members of a Constitutional Assembly and prepare a consensus document to be submitted to the Cabinet followed by Parliamentary procedure and a referendum. There would be a mechanism to submit the representations of the public for the Constitution to the Constitutional Assembly for consideration. This process would be a deviation from the drafting processes applied in the constitutions of 1972 and 1978. It appears to be that the Government do not wish to go to the extent of the process applied in drafting the South African constitution where the Public was consulted extensively. The resolution to this effect was published in the website of the Prime Minister and the link is given below – http://www.pmoffice.gov.lk/download/Constitutional%20Reform%20-%20Resolution%20E%2020151117.pdf. There is a debate whether we should abolish the executive presidency in toto and go back to the Westminster model or whether we should reduce the powers of executive presidency, keep the president under the law of the country and go on with the existing system. Under the present system even without the 17th and 19th Amendments to the Constitution we have seen how fragile the powers of the executive president from 2001 to 2004 where the President Kumaratunga was from one party and Prime Minister Ranil Wickremesinghe was from the opposing party. Wickremesinghe got 109 seats out of 225-seat Parliament where the opponent People’s Alliance got only 77 seats. It should be noted that only two governments got the minimum required seats of 113 under the 1978 constitutions. 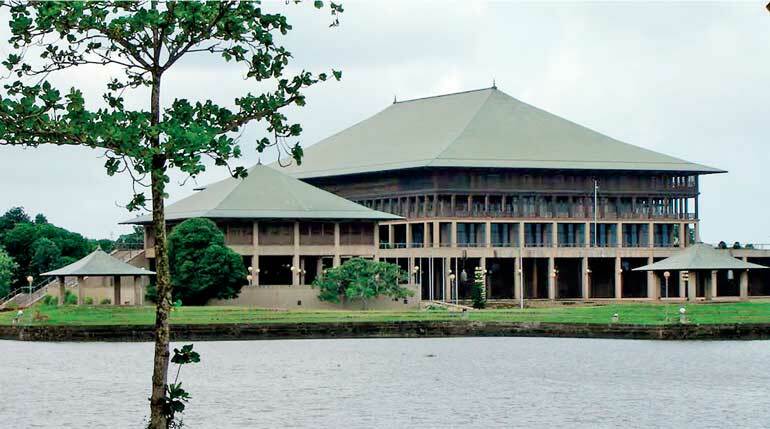 One was the UNP Parliament in 1989 where the elections were held under JVP insurrection and the UPFA Parliament in 2010 where the elections were held soon after the end of war where the popularity of the then President was very high. During the period from 2001 to 2004 Wickremesinghe governed the country in a phase where rapid changes were taken place. Financial control and the governance was entirely with the Parliament. The President had taken over three ministries and eventually the Parliament could have blocked the finances to the said ministries, causing a standstill. However the President dissolved the Parliament and Wickremesinghe lost the next general election. Had the power of the people was with Wickremesinghe the President could not have done any intervention of the policies of the Government apart from pinching it on and off. Therefore the problem of the existing system is that the President is above the law and excessive powers are given to the President. The reason for Jayewardene to have this type of system, I suppose, is that under the proportional representation system there would be a hung parliament in most of the cases. We have already experienced this. Therefore in order to have stability in the entire system the Executive will have to be strong. What really happened was that the executive was strong beyond the parameters of the “law” but unfortunately within the provisions of the constitution so that the situation was virtually “illegal”. That was the case although it was paradoxical. I presume that Jayewardene initiated the Presidents Fund in order to have a safeguard against financial control of the Parliament. Therefore if the executive presidency would be abolished there should be a strong Parliament. However the entire governance system should not be strong to the level of present system taking the executive presidency and Parliament together and also should not be weak to the level of present Parliament elected under the Proportional Representation system. It should be noted that under the initial system proposed by Jayewardene there were no preferential votes and instead the party secretary had the authority to nominate the Members of Parliament according to the number of seats allocated to the Party under PR system. It was changed subsequently in order to get the views of the people rather than the views of the party secretary represented in the Parliament. In the Constitution it was not allowed to change the parties by the elected members but the practice is different today due to the arrogance of the Judiciary which overlooked the big picture comprising of inherent checks and balances of the Constitution. Democracy which is practiced in Sri Lanka and for that matter in other countries in the Asian region is quite different to the democracy practiced in the countries it was originated and evolved over a period. Democracy in essence is the rule of the majority. Once again democracy in essence does not suppress the rights of the minorities. In fact it should safeguard the rights of the minorities. Collectivist behavioural patterns of the societies of the Asian countries lead to have different treatments to in-group members and to out-group members. The division of in-groups and out-groups can be based on the ideology, ethnicity, religion, caste, political party or any other division of the society. If there is a large number of any divided fraction based on any criterion given above it would be identified as majority. Similarly if the number is small it is identified as minority. In the cultural systems of the Asian countries the different treatment to the out-groups is accepted. Hence the different treatment to the minorities by the State is also accepted by the majority of that State. This is against the very essence of the democratic principles. Every one of us should be conscious of the cultural roots of this undemocratic behaviour and try to correct it consciously. In Sri Lanka this cultural root of collectivism which leads to different treatments to in-group members and out-group members in turn goes in two directions. One is authoritarianism in governance which is associated with another trait power distance and the other is ethnic problem which had devastating effect in recent history. Authoritarianism in governance is against the democratic principles and this comes to existence when the majority in power exercises absolute majority and the minority rights are diminished. On the other hand if the majority in power does not have the absolute majority the minorities would start agitating so that the situation may lead to anarchy in the State. There are enough examples for these situations in Asian democracies. In the recent regimes of Sri Lanka we have experienced authoritarianism. In Bangladesh in the recent history we have seen the anarchist situation due to political rivalry of the two lady Prime Ministers. Therefore taking into consideration of the democratic rules and our cultural traits, the governance structure we propose should neither be too strong or too weak. If the executive presidency is to be abolished PR system of electing members to Parliament is also to be abolished. It is not because of the ugly tussle to get preferential votes but because of the weak government the country is going to inherit. In alternative we can do away with this government-opposition relationship which is an essential part of the Western democracies. In this model we have to think of whether the government is going to be stronger or weaker which is in relation to the opposition. If this base is demolished there is no question of strong or weak government. Government should be comprising of the members of all parties represented in the Parliament. This is the model practiced at the present Parliament which can be improved further. Constitutional reforms should also address the other effect of our cultural root, ethnic problem or devolution of power. There is no room left to postpone the two major issues faced by the country, namely developing a new constitution and addressing the problem of devolution of power. Governance structure is shaped to deal with these demanding issues and it is the time to act now.